Deer hunting is one of the most exciting outdoor adventurous activities. It feels so right and so fulfilling when you have carefully made your way through thick woods, positioned yourself strategically and finally taken the shot. However, after hunting down a fat deer, another task lies ahead of you – Dragging or carrying your deer to the truck or nearby home. Well, we all know it is not a pretty good idea to carry a deer weighing 200lbs or even more on your back due to health risks such body pain or injury. When faced with such a tedious task, worry not, the sturdy deer carts are all you need to effortless haul your deer from one point to another. On the other hand, I wouldn’t deny the fact that choosing a great deer cart from thousands of models can be such a challenging task. Fortunately, we have done our research, tested several deer carts, and finally put together a comprehensive list of the top best deer carts available in the market today. 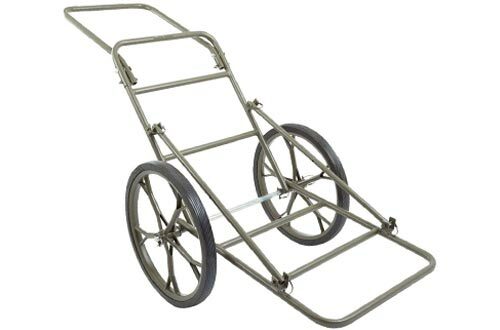 First on the list is the sturdy Guide Gear Deer Cart designed to make your hauling hassle-free. It boasts an incredibly strong framework that has a capacity of 300lbs. It is also equipped with puncture-proof 16” rubber wheels that easily roll on any rough terrain. Moreover, these wheels also ride on downed small trees, shallow streams, and large roots. 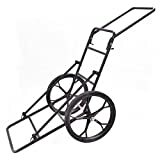 Another reason why you will brag about owning the Guide Gear Deer Cart is the perfectly balanced design that makes it easy for you to haul a load. 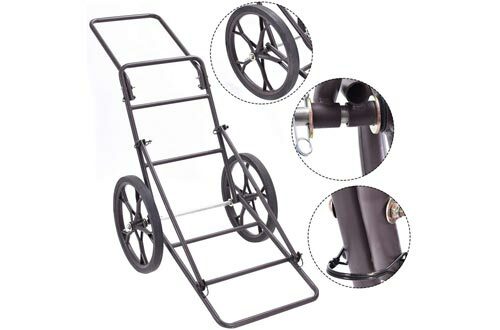 You won’t waste any more time thinking of how you will transport tree stands, deer, downed game and other slightly larger accessories, Guide Gear Deer Cart takes away the hassle. The Goplus Deer Cart is a beast that boasts both plenties of space and strength. 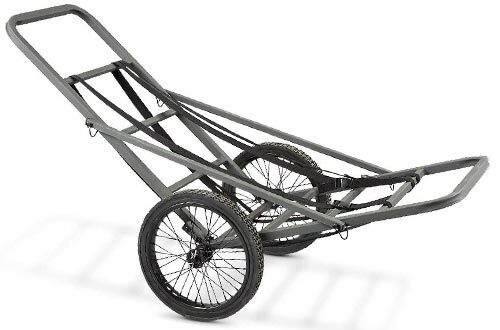 With a capacity of 500lbs, there is nothing that this deer cart won’t carry. Having demonstrated great strength with the Goplus steel construction, this unit makes the perfect choice when you want to move big trophy games and other large objects. Another adorable aspect of Goplus Deer Cart is the 17” rubber wheels that easily move over big logs, roots, and other large obstacles. 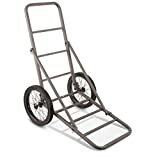 Plus, it is very convenient to move this cart from one point to another owing to its foldable design. 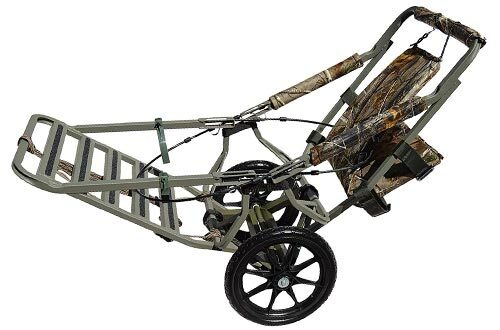 Overall, Goplus Folding Deer Game Cart is the ultimate choice when you want to conveniently haul large loads in the forest. 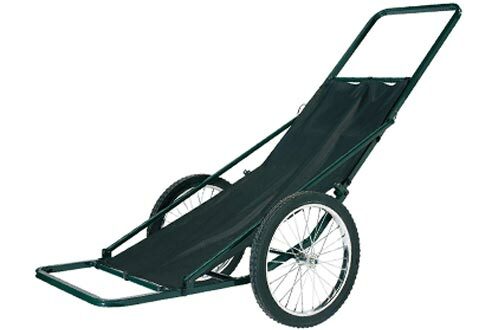 Go into the wild confident that your way back will be a breeze with the XtremepowerUS Game Deer Cart. It is one of the top-rated models that will make you want to break the banks just to lay your hands on this incredible hauling tool. With a weight capacity of 500lbs, you can haul three fat deer over large obstacles without feeling the pinch. It has a low centre of gravity to make your work easier on whichever terrain. The solid rubber wheels are stable and move on any small logs, roots among other obstacles with ease. Any hunting fanatic will appreciate the durable heavy-duty steel construction of XtremepowerUS Deer Cart. 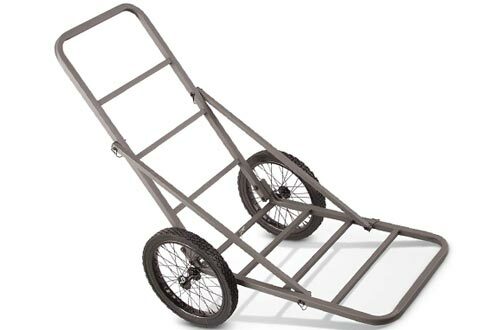 To make your transport and storage easier, this cart is foldable after removing the wheels. After the fun part of hunting is over and it is time to haul your hard-earned prey to your truck, the Leader Accessory Hunting Hauler Cart makes your work a breeze. It boasts plenty of open space for carrying your deer or any other heavy load. 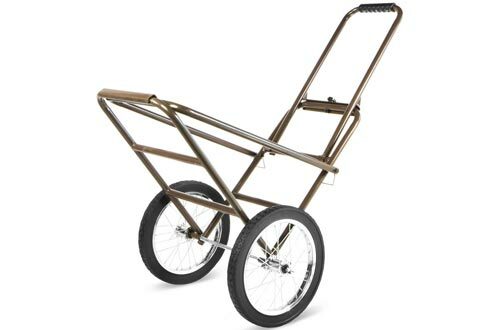 With a heavy-duty steel construction, this game deer cart can haul a load of up to 550lbs. 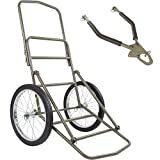 Even better is the 2 buckle strap system that enables you to hold your load onto the cart. When it is time to store your cart, you simply fold the welded square tubular-steel construction for hassle-free transport and storage. The puncture-proof 20” solid tires can move over wood obstacles with easy. With so many models of game cart claiming to achieve wonders, what sets the Summit Treestands Game Cart apart from the rest is its ability to handle the biggest of trophies home. 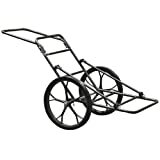 Featuring curved handles and plenty of storage space, this cart can carry loads of up to 350lbs. Heavy-duty 16” rubber wheels are designed to withstand any terrain and overloads. Even better, the bottom of Summit Cart features edged teeth for traction and overall stability. If you are tired of game carts that can never stay steel, the Summit Treestands Game Cart never disappoints. Three utility straps are also integrated into this cart to help secure your game or any other load. The Rage Powersports is an all-rounder that will transport gigantic games weighing up to 500lbs. It is intelligently designed to distribute weight while maintaining desired stability. The 18.5” rubber tires are solid durable and are made with strong steel rims and spokes. Apart from boasting a sturdy steel construction, this game cart has great attention to style and dark hunter brown finish. No more struggles with hauling trophy games out of the woods, Rage Powersports takes care of all the hassle. Another interesting fact about this game cart is the fact that it features a quick-wire assembly. This implies, when it is time for storage, the entire setup folds into a compact easy-to-store unit. When you have heavy loads to haul in the forest, Best Choice Products Deer Game Hauler Cart is one of the best hauling carts available in the market today. Be it a sturdy steel construction, plenty of storage space or two utility buckles, Best Choice Products has it all. The heavy-duty steel axle boosts durability. The 500lbs capacity implies you can haul two adult deer. The solid rubber wheels take away the guesswork associated with wheels that can be punctured. 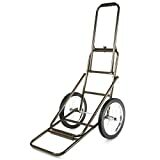 To ease your storage and transportation, the wheels of this hauling cart are removable. 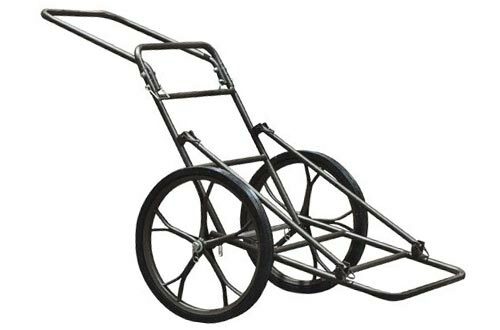 Overall, it is a perfect hauling game cart boasting of great durability and solid performance. When you want to gear in and out of the woods in style, try the Sherpa Game Cart Kit Summit Classic. It is an outstanding game cart that will turn your stand into a solid cart within the shortest time possible. Hands down, it is one of the best tools for your treestand. Setting up the entire configuration is pretty simple, it doesn’t require any modification. The 16” airless wheels are pretty durable and can roll over anything in the woods. No matter how the terrain gets rough, you can always rely on Sherpa Summit Viper Classic Game Cart Model, it is superb. This is another high-quality game cart that will make your work in the woods easier. It is one of the best in the market and boasts of unparalleled convenience when transporting your game or gear. Most adorable is its heavy-duty construction that can haul up to 750lbs. To get started with the Kill Shot Game Cart, no tools are required. In order to avoid arm strain and back pain, the tow bar attaches to the trailer hitch. Rubber sleeve padding is well integrated into the tow bar to prevent damage to the cart. The 20” Solid rubber wheels are tough and raised to roll over any unfamiliar terrain. To sum it up, this game cart makes a great choice when you want to haul gigantic trophy games or two to three deer. Want to gear up into the woods and get back home without feeling the pain of hauling your game trophy or deer? 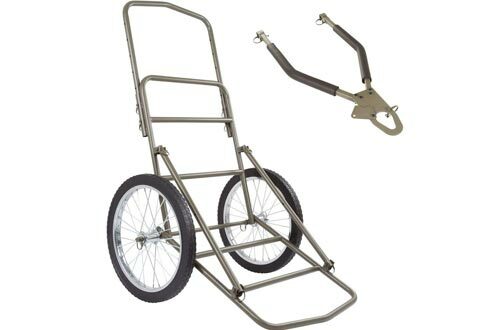 Well, how about the Guide Gear Aluminum Deer Cart? 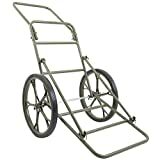 It is an outstanding hauling cart designed to make your day great and full of fun. 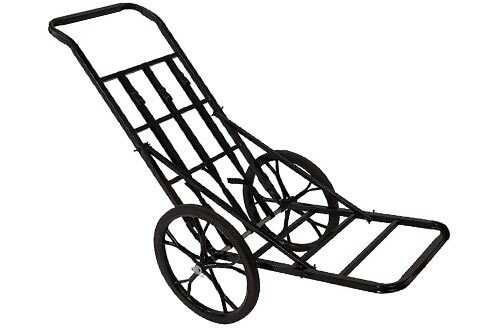 With a capacity of 250lbs, this cart will haul your tree stand or deer effortless to the final destination. It is Herculean strong and is designed with a low C.O.G to ensure you experience zero weight on the handles. Another cool feature is the 16” solid rubber spoked wheels that can roll over in the worst terrain or condition. Read more about the pocket hunting knives.